It's been quite a 2018 for smartphones already, and we're not even half way through the year yet – some of the top-class handsets we've seen revealed so far include the LG G7 ThinQ, the OnePlus 6, and most recently the HTC U12+. So how do they all compare? 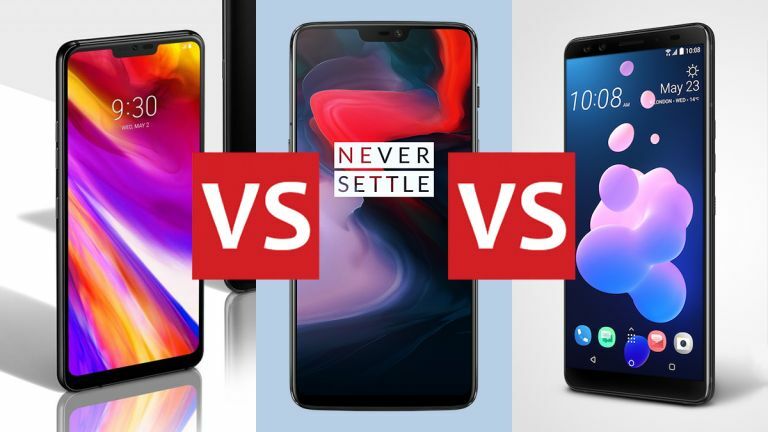 Here we'll put three of 2018's best smartphones head-to-head in all the areas that matter, covering specs, features, sizes, screens and more. Whether you're interested in buying one of these phones or are just interested in how they match up against each other, read on. At 6.28 inches, the OnePlus 6 has the biggest screen here, followed by the LG G7 ThinQ at 6.1 inches and the HTC U12+ at 6.0 inches. The HTC U12+ is actually the tallest phone though, at 156.6 mm (6.2 inches) – something to bear in mind for the small of hand. At 7.8 mm (0.3 inches), the OnePlus 6 is the thinnest handset of the bunch. While we're talking about screens, we should mention the OnePlus 6 sticks to a Full HD resolution of 2280 x 1080 pixels. The HTC U12+ boasts a 2880 x 1440 pixel resolution, while the screen of the LG G7 ThinQ carries 3120 x 1440 pixels. In terms of the overall design, these are three very stylish-looking handsets. All of them have glass backs with a glossy finish, though OnePlus is offering a more matte black version as well as mirror black and limited edition silk white choices, while HTC has prepared a translucent blue backing to go with the more standard red and black. LG has given its phone most colours though, with grey, black, blue and rose available depending on where in the world you live. Don't forget the screen notch too, an essential part of today's smartphone designs – the HTC U12+ display doesn't have a notch, while the LG G7 ThinQ and OnePlus 6 have notches you can opt to turn off in the software. These three flagships are all very much as powerful as each other – they're all running on the Snapdragon 845, Qualcomm's top model chip for 2018, so there shouldn't be too much difference between them in terms of performance. The LG phone offers 4GB or 6GB of RAM, the HTC one 6GB of RAM, and the OnePlus handset 6GB or 8GB of RAM. As for internal storage, you can go for 64GB or 128GB with the LG G7 ThinQ or the HTC U12+, and 64GB, 128GB or 256GB with the OnePlus 6. With any of these phones, though, you can extend the internal storage with the help of a microSD card if you need to. The camera quality is something you can't really judge on specs alone but let it be noted that we've been impressed with the pictures coming out of all three of these devices. All three have a dual-lens rear camera: 16MP+16MP for the LG G7 ThinQ, 16MP+20MP for the OnePlus 6, and 12MP+16MP for the HTC U12+. The HTC is the only phone with 2x optical zoom for getting closer to the action. Another key spec you'll want to know about is battery size: 3,000mAh for the LG G7 ThinQ, 3,300mAh for the OnePlus 6, and 3,500mAh for the HTC U12+. Bear in mind though that battery life depends on a host of other factors as well, including the power draw of the screen and other components. These are three feature-packed phones so we've still got plenty to talk about. For example, all of these handsets come running Android 8.x Oreo, and are likely to be some of the first phones in line when the Android P upgrade rolls out later in the year. Both the LG G7 ThinQ and the HTC U12+ are IP68 rated, which means they're well protected against dust and water – those two phones should be able to survive a substantial amount of time in a substantial amount of liquid before damage is done. The OnePlus 6 doesn't have an IP rating, but is described as "water resistant": think a few light splashes rather than a dive in the swimming pool. The OnePlus 6 doesn't have wireless charging capabilities either, and nor does the HTC U12+. If you want a handset that you can place on a pad to juice it up, you're going to have to go with the LG G7 ThinQ. There are a few other features worth flagging up, but they're not necessarily going to make you switch from one handset to another: the LG G7 ThinQ has AI-assisted photo modes, to pick settings before you take a shot, while the HTC U12+ carries on the squeezable sides trend started by its predecessor – it has Edge Sense pressure-sensitive controls down the edges that let you take photos, launch Google Assistant, and more. Prices can vary over time and from store to store of course, but if you're looking for the cheapest phone here then it's definitely the OnePlus 6 – the starting price for the lowest configuration is £469/$529. Compare that to £619/$749 for the LG G7 ThinQ and £699/$799 for the HTC U12+, and the OnePlus starts to look very good value. But is it the best value phone out of the three? That relatively low price, coupled with the top-level power that you get with the OnePlus 6, certainly makes it hard to beat. It makes up for some disappointments, like the fact that it's only a Full HD resolution screen, or the lack of an IP68 rating. As for the other two, it's a close call considering the LG G7 ThinQ is slightly cheaper and the HTC U12+ is perhaps slightly better specced (with that 2x optical zoom on the rear camera, for example). It might come down to whichever design you prefer, or whichever manufacturer you've bought phones from in the past (which means the particular flavour of Android will be easier to get to grips with). Really though all three of these phones are going to do a superb job in powering through whatever tasks you set them, taking fine photos on the go, and lasting you a good long while until the next upgrade cycle.